With Standhardinger ejected in the second quarter and his twin tower partner June Mar Fajardo busy extricating from double teams down low, SMB’s perimeter gunners took over as the Beermen finally caught up with the hot-starting Fuel Masters in the third and wrested the upperhand for good in the fourth to post a followup to their 100-88 opening win. MANILA, Philippines — San Miguel Beer summoned its championship form in overcoming a 12-point deficit and bucked the ejection of Christian Standhardinger to score a hard-earned 92-82 win over Phoenix Pulse for a 2-0 lead in the PBA Philippine Cup semifinals last nght at the Smart Araneta Coliseum. “We’re lucky we’re able to escape from this game with a victory,” said coach Leo Austria, whose wards played on the backfoot for a good majority of Game Two. facing their biggest disadvantage at 26-40. “We know from the start it will be a hard game for us. We’re expecting to them play really hard and it was evident in the first half. Phoenix knows how to stop us, disrupt our offense but the players refused to lose. They knew the importance of this game, and their experience came in handy,” added Austria. Terrence Romeo came off the bench to deliver eight in the fourth quarter, his last baseline basket giving SMB a 76-75 lead. Marcio Lassiter proved golden in the clutch, too, firing nine in the mop-up including a booming trey that handed the Beermen an 84-80 cushion entering the last two minutes. Rain or Shine seeks to tighten the noose on embattled Magnolia as it shoots for a 3-0 lead tonight in their own semifinal showdown. 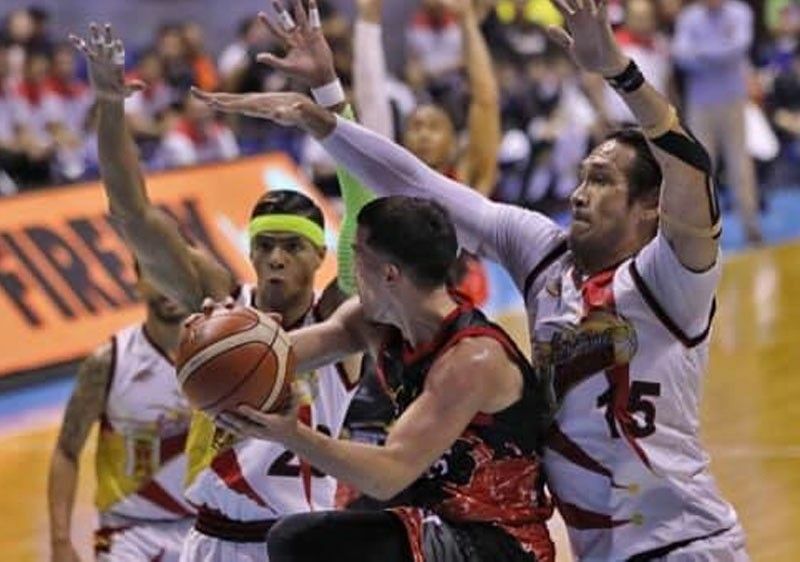 The Elasto Painters took the first two games of the series, 84-77 and 93-80, and intend to sustain the charge to move closer to that coveted finals seat. “It’s still a long series. We know Magnolia is capable of coming back,” said Rain or Shine coach Caloy Garcia. Phoenix 82 – Abueva 16, Wright 13, Perkins 12, Chua 12, Jazul 12, Mallari 8, Intal 4, Marcelo 2, Kramer 2, Mendoza 1. Quarterscores: 13-21, 37-46, 63-63, 92-82.